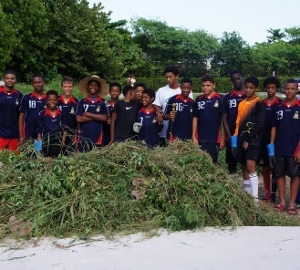 (CIYFP): Players and coaches from the Cayman Islands Youth Football Programme’s Under 14 team participated in a yard clean-up at the residence of Tommy and Mechon Ebanks in West Bay this past Saturday. The Ebanks’ daughter, Skylar May, was born in May last year with Anaplastic Ependyomoma (malignant brain cancer) and since then the parents have been travelling back and forth from the United States seeking treatment for their daughter. With the Ebanks working, the Programme’s coaches decided that they would lend a helping hand and clean-up their overgrown yard. On Saturday afternoon after a two-hour training session at the Old Man Bay Field in North Side under the watchful of head coach Ernie “Gillie” Seymour, the players and coaches ventured to West Bay to tackle the family’s yard. Two hours later, the Ebanks’ yard was “reborn”, much to the delight of Mr Ebanks. Over the last four months, players, parents and coaches from the Cayman Islands Youth Football Programme have been fundraising to cover expenses for their trip to Las Vegas to participate in the 2014 Mayor’s International Showcase in February. As part of their fundraising efforts, it was decided that a donation be made to the Ebanks family to offset some of their travel and medical expenses as they seek treatment for little Skylar. On Sunday, February 9, at the morning church service at the Boatswain Bay Presbyterian Church, MrEbanks was presented with a cheque by the players from the Programme. The Cayman Islands Youth Programme consists of 45 of the best players in the Under 14 age group from all clubs in the Cayman Islands. The ultimate goal of the Programme over the next few years is to prepare players to represent the Cayman Islands at the Under 15, Under 17, Under 20 and Under 23 levels as members of the Cayman Islands National Teams. Teams from the Programme will continue to participate in overseas tournaments in the United States and other countries to gain exposure for players in the hope that they will be seen by high school and college coaches and potentially earn scholarships to further their education and play at a higher level. Also, the Programme will expose players to professional youth academies in the United Kingdom and other parts of Europe. Good job coach & team . I think that your good deed is a shineing example to the whole world . Keep up the good works and you will be the top team.